No more — not at least according to the cult-loved, Houston-based skincare label, Sunday Riley. Sitting in a pressurised cabin with filtered air affects our skin in many ways — in particular, dehydration. Image source: Shutterstock. Airplane cabins are notoriously dry. For one, the World Health Organisation gauges in-flight humidity levels to be lower than 20 percent — a whole lot lower than the usual home humidity levels of 30 percent. But that’s really just a generic guide. Different aircraft models boast different humidity levels — an A350 flight clocked a low of 6 percent humidity, an A380 saw 9 to 13 percent, while a full A321 flight clocked a high 21 percent, according to a report from Aircraft Cabin Management. Why is the air so dry? It’s out of necessity. When air is drawn from the aircraft’s surroundings into the cabin, it’s filtered and dehumidified to slow the corrosion (moisture induces corrosion of certain metals) of the plane’s aluminium body. And when it comes to average home humidity levels, Singapore is nowhere near 30 percent. We are a notoriously humid country, so numbers may fluctuate anywhere from 60 percent on a hot and dry day, to a whooping 96 percent. So that means for Singaporeans, our skin is adapted to high humidity levels of 70 percent. When we step into a flight cabin with 12 percent humidity, it’s a drastic change that may be taxing for the skin. Designs for Sunday Riley’s amenity kits on board United Airlines. Image source: United Airlines. How does the dry air affect your skin? Many ways. First, there’s skin dryness as moisture leaves the skin. 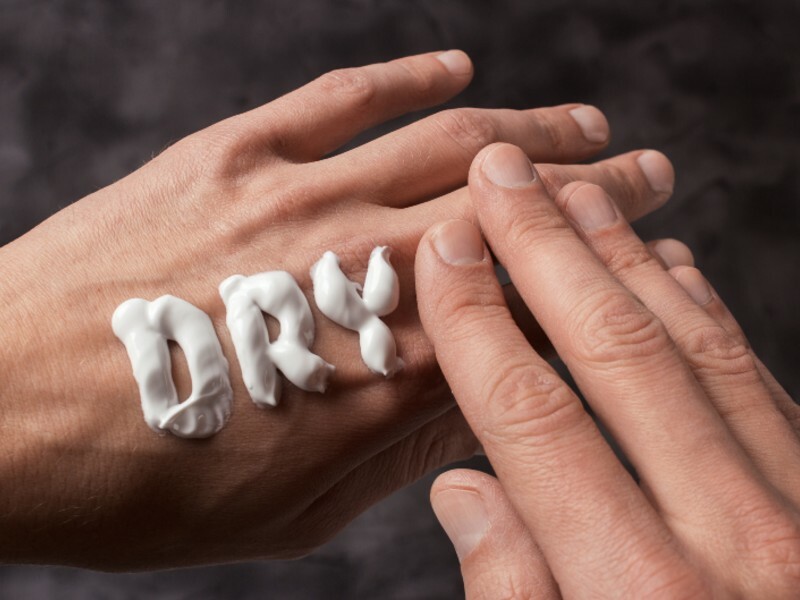 Excessive dryness may cause redness, itching, and trigger acne. When dryness sets in, the skin works hard to replenish its moisture levels by producing more oils — essentially going into overdrive. That aside, the dryness will affect your “eyes, mouth, and nose,” notes the World Health Organisation. Finally, according to a dermatology research paper, the drastic change in environment stresses not only our skin, but our body and mental well-being. You might experience bloating, discomfort, and altogether anxious and irritable. There are ways you can take care of your physical and mental well-being on board: watch your diet, avoid heavy meals, and consume natural ginger teas to stave off that bloating and indigestion; bring natural oil balms to calm your senses. When it comes to the skin, hydrate yourself with lots of water, and bring with you (or use Sunday Riley’s) hydrating in-flight skincare regime. 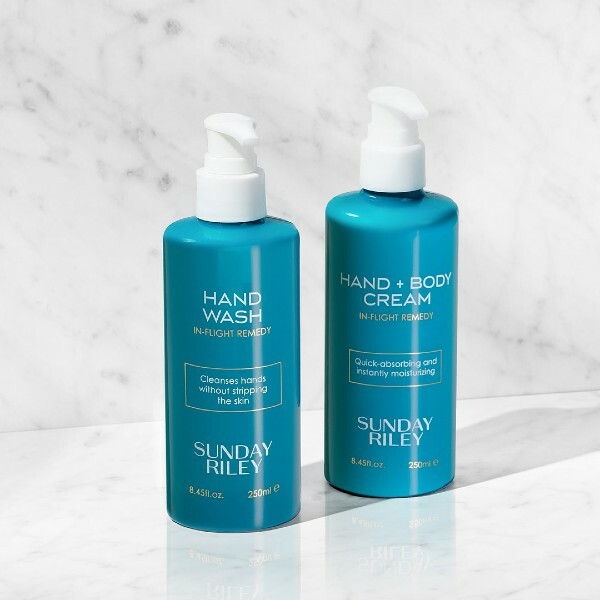 The founder herself, Sunday Riley, reportedly came together with her team to formulate their in-flight products. “Sunday and her team really took the time to understand how travel and the aircraft environment affects our customers and formulated an in-flight remedy that complements their journey with United from beginning to end,” says Mark Krolick, United Airlines’ vice president of marketing, in an official release. 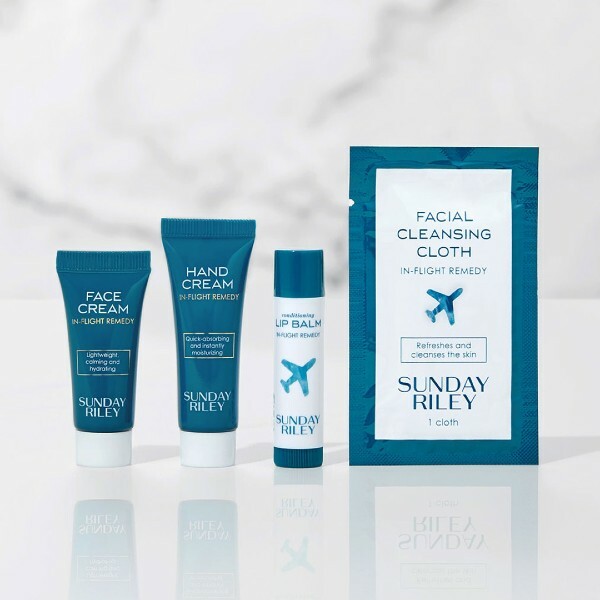 From left: a lightweight, calming and hydrating in-flight face cream; a quick-absorbing and moisturising in-flight hand cream; a lip balm; a refreshing facial cleansing cloth. Image source: United Airlines. First up, the face cream. While Sunday Riley’s current moisturisers include the Tidal (S$32), an enzyme-based brightening moisturiser, and the C.E.O. (S$32), an anti-oxidant repair moisturiser, this new in-flight face cream does sound quite different. It’s made from “a blend of botanicals to hydrate and soothe skin,” notes the official release. The hand cream marks a first for the brand. Ingredients include shea butter, cocoa butter, and rosehip seed oil. Likewise, other new products include the single-use cleansing cloth, formulated with peppermint extract “to balance oil and invigorate skin”, and the lip balm made from pomegranate seed oil and shea butter. In-flight bathroom hand wash, and an all-over cream. Image source: United Airlines. That aside, the lounges’ shower facilities and in-flight bathrooms will be equipped with all things Sunday Riley: a hand wash made from cucumber and green tea extract, a shampoo with cucumber extract and rosehip seed oil for hydration, a conditioner with pomegranate seed oil, a similar body wash, a hand and body cream, and a face mist. Sunday Riley is taking off! ✈️ We’re excited to announce our newest partnership with @United. Now, you can find your favorite skincare brand in Polaris amenity kits on your next long-haul flight, in lavatories, and in United Polaris and United Club lounges with shower facilities. These new products were all designed exclusively for United to meet your skin’s needs or extra hydration as you fly. 💦 Where do your travels take you next? Like all of Sunday Riley‘s products, the in-flight range will likely be 5-free, soy-free, cruelty-free, and vegan. A glance at United Airlines’ updated in-flight amenity kit, complete with Sunday Riley products. Image source: United Airlines. 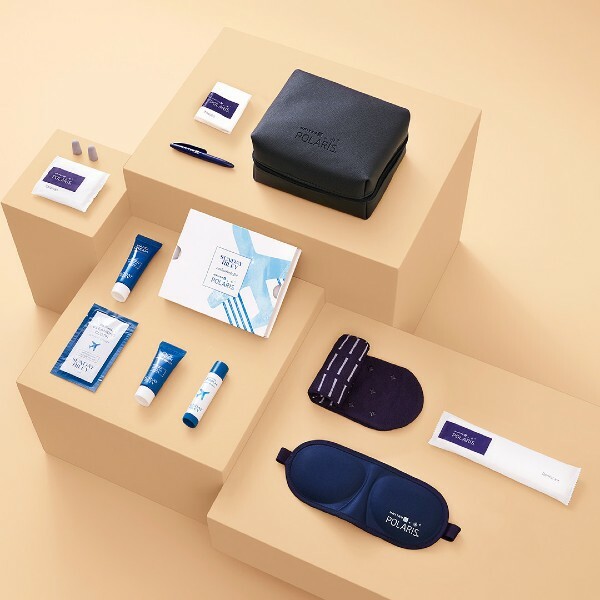 The amenity kits will be made available in three in-flight tiers, namely the premium transcontinental routes, meaning coast-to-coast flights within the US such as New York to Los Angeles, New York to San Francisco, or Boston to San Francisco. If you’re travelling on this tier, you will get just one Sunday Riley item in your amenity kit — the lip balm. Then there’s the premium plus, which is the premium economy tier of international flights. Guests will receive two Sunday Riley products when travelling on this tier — the lip balm and hand cream. 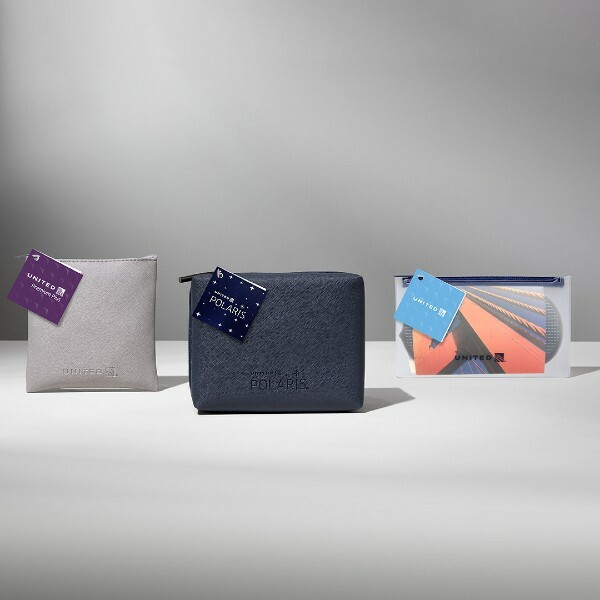 Finally, business class flyers will receive the full Sunday Riley amenity kit. All of the premium bathrooms will, too, be furnished with Sunday Riley bath products.